Can Iraq’s disintegration be prevented? » Ambassador Fabian’s blog, KP Fabian, Analyst - international political developments, global issues, Indian national issues. Can Iraq’s disintegration be prevented? At present (July 2, 2014), it is difficult to see how the ongoing implosion of Iraq can be stalled and reversed. The world started taking note of ISIL and its leader Abu Bakri al-Baghdadi, 43, who has been declared as ‘caliph’ of an ‘Islamic State’ claiming sovereignty over a stretch of territory from Aleppo in north western Syria to Diyala in north eastern Iraq only when Mosul fell on June 20th. But, his forces had taken over Raqqa in Syria March 2013; and Falluja in Iraq in January 2014. ISIL, a breakaway group from Al Queida in Iraq, is basically a part of the Sunni Resistance to the 2003 US invasion and occupation of Iraq. US had made unsuccessful, half-hearted, and not always judicious attempts to build an Iraq that could accommodate the three groups there, namely, Shias, Sunnis, and Kurds. But, Prime Minister Maliki, who got his office in 2006 thanks to support from US and Iran carried out a policy of alienating the Sunnis and the Kurds. His reckless partisan policies created the conditions for the emergence of a formation called Islamic State of Iraq (ISI) to grow and derive support from the Sunni population. Once the situation in Syria was found favorable, ISI extended its operations to Syria and changed its name to ISIL. L stands for Levant from Spanish Levante meaning east as well as the wind in the eastern Mediterranean. Basically it means Syria, Jordan, pre-Israel Palestine, and Lebanon. ISIL has money (about $2 billion), weapons (mainly US origin) and many of their men are in US Army combat uniform, even with interceptor body armor. They have Humvees and Blackhawk helicopters. They have manpower as young men from Chechnya, UK, France, Jordan and elsewhere have joined them reminiscent of the International Brigade in the Spanish Civil War in the 1930s. While the ‘caliphate’ might not have the strength to take over Baghdad, the fact remains that it will be enormously difficult for the government in Baghdad, under Maliki or his successor, to recapture the territory already under the control of the caliphate. This means that there is already a Sunnistan in Iraq with a part of Syria also in it. The Kurds spread over Iraq, Syria, Turkey, and Iran number about 30 million. They have their national ambitions. Saladin the Great who fought the Christians during the Crusades and captured Jerusalem in 1187 was a Kurd. After World War 1, the Kurds were promised autonomy under the Treaty of Sevres (1920), but it was never implemented. Following the liberation of Kuwait in 1991, US imposed a no-fly zone in Iraqi Kurdistan enabling the Kurds to progressively assert independence from Saddam Hussein’s central government in Baghdad. Under US occupation starting from 2003, the Iraqi Kurds gained further and the current constitution provides for virtual autonomy. There is much tension with Maliki who has withheld money to the regional government which without permission dug a pipe line to Ceyhan in Turkey to sell oil. The first tanker reached Israel recently. Since the 1960s Israel has been cultivating the Kurds and now Prime Minister Netanyahu has publicly endorsed an independent state for Iraqi Kurds. They might hold a referendum soon on independence. The main reason US has sent military, about 800, to Iraq is to take care of the safety of its embassy. President Obama does not want a repeat of the humiliating helicopter escape from Saigon of its ambassador in 1975. If Baghdad witnesses a carnage with Sunnis and Shias killing each other it will reflect badly on Obama’s performance as commander in chief. But, that said, US might not mind a disintegrated Iraq in the long run. Iran too might conclude that it is not worth sacrificing men and money to retain Iraq as a single entity. 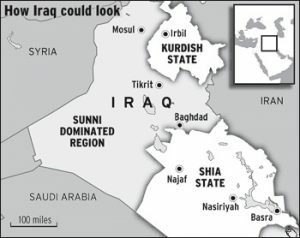 Thus, Iraq might have a Kurdistan, one or more Sunnistans, and a Shiistan. The last one will remain Iran’s protectorate. The Arab Spring when it started in 2011 as a move towards democracy did not affect adversely India’s interests. India had reasons to welcome a move towards democracy. But, when the Arab Spring lost its way, except in Tunisia, and political instability with civil war, fuelled by extremist violence and ideology set in, India realized that it had reasons to worry on many counts. First, there are over 7 million Indians in the Arab world, most of them in the Gulf where currently there is no political instability. The difficulty in arranging for the evacuation of 44 nurses from Kerala held up in Tikrit is an example of the problems to be confronted from time to time. India did arrange for evacuating 176,000 of its nationals from Kuwait and Iraq in 1990-1991. Second, the oil price has shot up forcing an increase in the price of petrol, pushing up inflation that needs to be brought down. Third, the worsening Shia-Sunni tension can have an adverse impact on the two groups who have hitherto lived in peace in India. There are reports of some young Shia men wanting to go to Iraq. The Government should be able to prevent them from going. India has no means of influencing the course of events in Iraq or Syria, but that is not exactly a fault of India as external intervention has so far only aggravated the crisis. There are about ten thousand Indians in Iraq with the majority in Kurdistan and in Basra. Fortunately, there is no immediate danger to them. Reality Check: Where Is The ‘56-Inch’ Chest? The Attempted Coup in Turkey: What Next? Will Israel attack Iran? It cannot be ruled out.